This year marks the 5th anniversary for Bandai's super-popular Kamen Rider S.H. Figuarts. 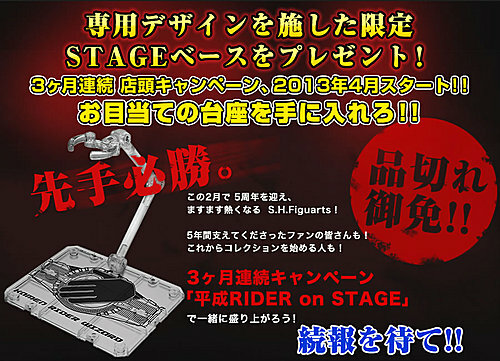 In celebration, for three months beginning in April 20123, Bandai will be releasing special Tamashii Stage stands for some of the Heisei Kamen Riders. The bases for each stands will have the design of a henshin (transformation) belt one of the Heisei Kamen Riders. The release schedule for these stands has been partially revealed. The first wave will include : Wizard, Den-O, OOOs, Kabuto and Agito. Wave 2 will include: an alternate Wizard base, Fourze and Ryuki. With one of the slots still a mystery. Wave 3 is totally up in the air, unless you look at the picture of all the bases and eleminate the ones that have been revealed. Then you can pretty much figure out which ones will be released in this set. No word yet on the price for these stands. Lets hope that the price is right, as these will go great with a full set of Heisei Kamen Riders!